﻿ Parking fees protest needs you! Parking fees protest needs you! Motorcyclists are being asked to converge on London on December 7 to protest about parking fees for bikes in Westminster. Organised by the No To Bike Parking Fees (NTBPF) campaign, the protest will have two elements. 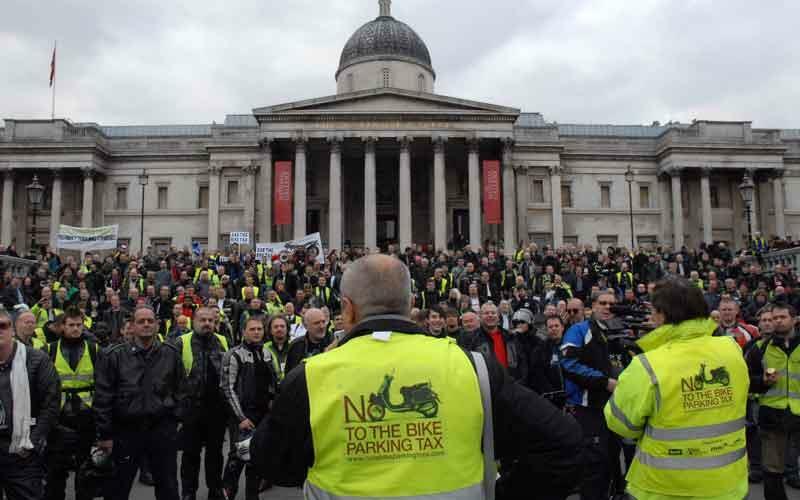 Riders are being asked to attend a Westminster Council led meeting of Partnerships in Parking (PIP) at Westminster City Hall to protest about the introduction of the fees in the morning and then to ride to the DCLG headquarters in Bressenden Place, SW1 in the evening. NTBPF has organised various protests to try to get the city to overturn its decision to introduce parking fees for motorcycles. The fear is if Westminster can get away with making bikers pay to park, other cities will follow suit and eliminate free parking for bikes for good. The British Motorcyclists Federation is supporting the campaign, and says riders need to make their objection known. A spokesman said: “The PIP factor has just added to the unfairness of a scheme that already runs contrary to the Government’s stated aim to ‘mainstream’ motorcycling. “While the daily charge of £1.00 may appear low, PTWs with their efficient use of space do not cause congestion, are able to filter through traffic congestion and when parked only take one eighth of a car parking space.